… here it comes, the wind we had been waiting for! 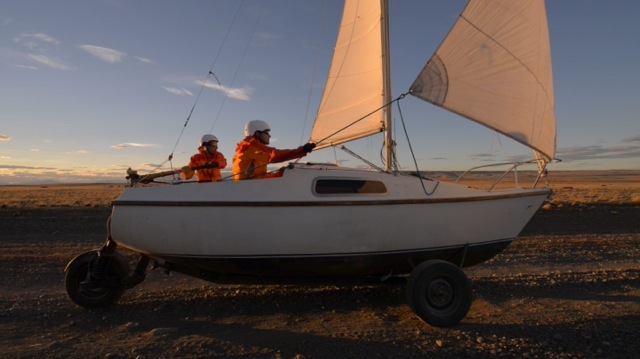 Under full sail and with about 20 km/h – we rather fly over the gravel roads of Patagonia. 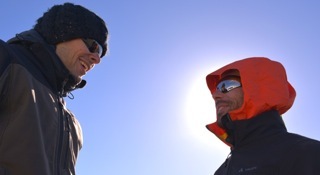 After a non-stop journey from Buenos Aires to Patagonia, we have finally arrived. After three days of travelling, we still haven’t completely got over the 2800 kilometres and the endless gravel roads. 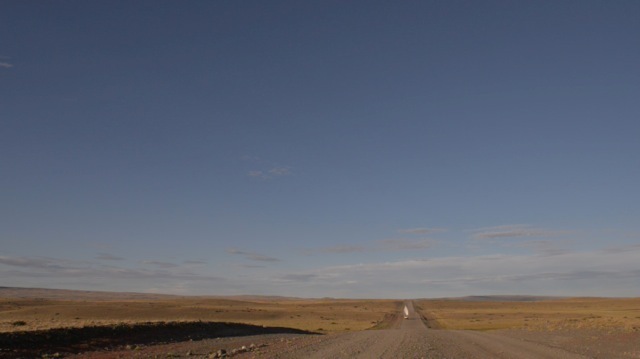 On the other hand, our ride across Argentina was quite impressing: vast landscapes, an endless sky, friendly people and strong wind, occasionally so strong that it nearly hindered our moving forward by car – a foretaste of what will expect us in the far South. 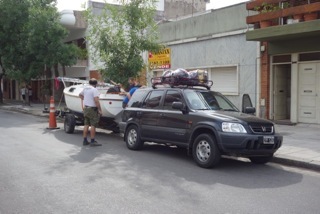 After the strenuous preparations in Buenos Aires and the long travel we took things a bit more easy in Calafate. 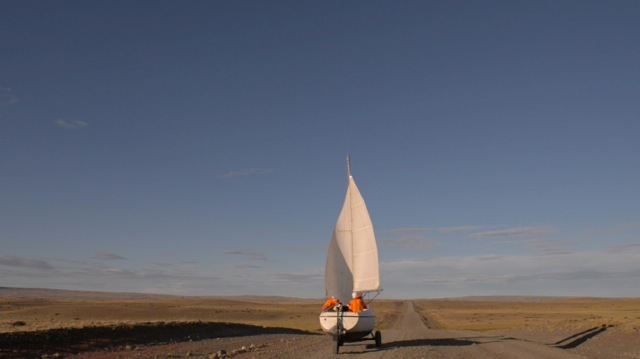 We bought some necessities, adapted our equipment to the local circumstances and some repair works on the Land Sailor were dealt with, as it was affected by the long and strenuous journey just like us. 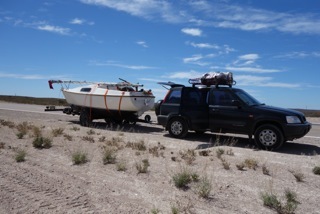 All the last necessities obtained, we set out to our starting point, which was situated about 200 kilometres to the south of El Calafate in the middle of nowhere. We chose a calm and rather straight section on Ruta 40 with light traffic and few slopes. 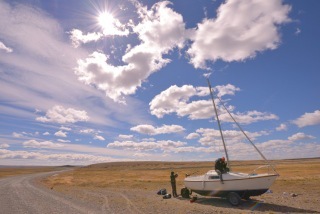 The wind in Patagonia coming mostly from the West, it was here we found the perfect conditions for sailing. 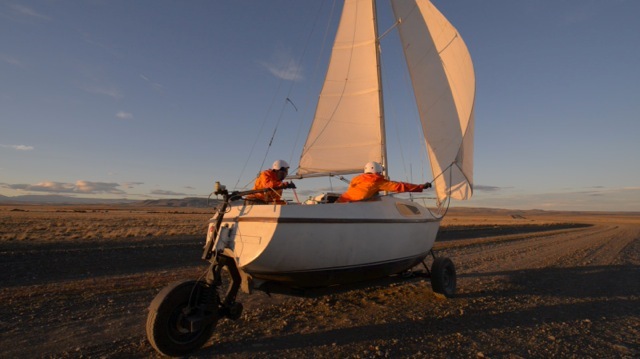 Before we could start, however, the trailer had to be reconverted into the LAND SAILOR – an undertaking which took us almost a whole day. Tension rose: Even though we had had some test runs in Germany, it stayed unclear until then, if the whole idea would finally work out in the conditions we found in Patagonia. Being perfectly well-prepared, you can still be surprised by the real conditions. As there was no similar project whatsoever, we couldn’t rely on any experience, either. The whole project was therefore an artist’s experiment whose early failure was possible, and thus, we were all quite nervous. At the same time, we shared our common confidence in the project, which had brought us all there to tackle the advantage. After some minor, but successful test runs for trying the brakes and sailing equipment, we finally started heading north.